» Home » 2013 » November » 20 » Cowan Tetrapod Collection Databases Have Evolved! Cowan Tetrapod Collection Databases Have Evolved! It’s a revolution! Cowan Tetrapod Collection (CTC) databases emerge from the Victorian closet to join the 21st century! How? Traditionally, specimen records are recorded in ledgers. In the Victorian era these were magnificent leather bound oversized books with gold leaf lettering. As wonderful as it is to step back in time and to read the handwritten notes – it is cumbersome and the “Control Find” function is frustratingly not available. Grant Hurley, CTC Informatics Specialist and Christopher M. Stinson, CTC Curatorial Assistant have spent the better part of a year toiling away to compile the necessary information, georeferencing, and transform all the information using DarwinCore protocols in order to publish our mammal, reptile and amphibian holdings. The same gruelling effort resulted in the avian databases coming online in July 2012. The entire CTC staff is delighted to announce that as of June 17, 2013, the entire bird, mammal, reptile and amphibian UBC Beaty Biodiversity Museum specimen catalogues are available online via the international multi-museum VertNet search engine. Now when researchers and citizen scientists from around the globe want to find out what is in our museum collection – they can either use conventional database fields or use Google Earth tools to track down specimens. 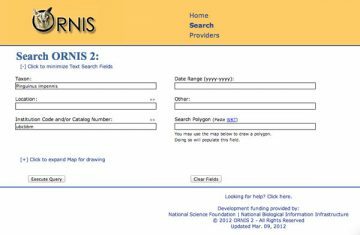 A snapshot of an actual search using ORNIS. UBCBBM is the institution code for the Cowan Tetrapod Collection at the Beaty. If you want to see how many, and where all the Great Auk specimens are residing – leave this field blank. Then press “Execute Query”. Alternately, try activating: “[+] click to expand map for drawing” to activate Google Earth. Draw a large polygon around Newfoundland – you will discover the majority of the world’s skeletons of this extinct species come from the same small islet with a memorable name. This database revolution helps the world access a Victorian curiosity house here on the UBC campus. The next time you visit the Beaty Biodiversity Museum – why not stop at the “Exploring Ecology and Conservation” set of drawer banks between the Fungi section of the Herbarium and the Spencer Entomological Collection to see some Great Auk bones! They are located in the northern-most bank top (i.e. not in a drawer). 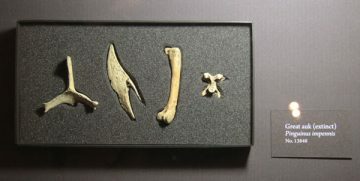 Great auk bones on display in the “Exploring Ecology and Conservation” set of drawer banks at the Beaty Biodiversity Museum. The Cowan Tetrapod Collection is very proud to be part of the international multi-museum VertNet search engine. Species, localities, or collectors can be searched using conventional database fields or by drawing Google Earth polygons. Photo at top: (Left to right) Grant Hurley and Christopher Stinson document specimens of the Cowan Tetrapod Collection for the new online databases.